The technological advances of today’s gas fireplaces provide every one of the traditional benefits, along with greatly increased energy efficiency and user convenience. Gas fireplace systems from Mantels Plus offer you instant start-up and the security of operating during a power failure. You can operate your fireplace with a thermostat for increased heat control or with a remote control for even greater convenience. Modern gas fireplaces come in a variety of sizes and styles to suit any home. You can choose from single-sided, free-standing, or multi-sided fireplaces. Some fireplaces can be incorporated in wall units, bars, and even coffee tables! Some models can now be installed to divide indoor & outdoor living areas. Most models are available in natural gas or propane, and can be vented using an existing chimney or straight out through any wall. 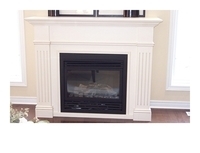 Mantels Plus has been building top quality fireplace mantels since 1984. With thousands of mantels under their belt, Mantels Plus has seen and built virtually all types of wood mantels imaginable. This experience allows you to choose from a variety of standard styles or have a custom design to complement your taste and home decor. Our mantels are built & designed by our in-house craftsmen, and meticulously finished by hand to ensure you get the best quality and attention to detail. Having our own woodworking shop gives us the diversity to offer you custom mantels, to complement your fireplace or any other room in the home. This unique concept allows your to explore virtually unlimited design possibilities for your home. 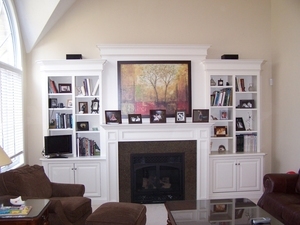 Over the years, Mantels Plus has earned a solid reputation for custom woodworking. Besides custom fireplace mantels, Mantels Plus also custom designs and builds wall units, bars, entertainment centers, kitchens, walk-in closets, desks and bookshelves. 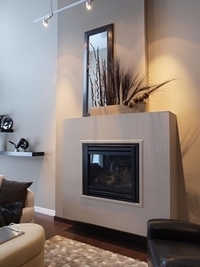 We have become well known for incorporating gas fireplaces into wall units and entertainment centers. The design team at Mantels Plus will work with you to achieve the design that best suits your taste and space requirements. From a small bookshelf or stereo stand to a full wall unit or bar, we will build to your specifications. Whether from a photograph or your imagination, we will do what we can to accommodate your needs. Mantels Plus works with reputable suppliers in order to provide you with the best products.